Some of Europe's elite table tennis players and coaches gathered together in Luxembourg on Tuesday 12th September to take part in a press conference ahead of the Liebherr 2017 ITTF-European Championships, laying out their hopes and targets for the upcoming event which will take place from Wednesday 13th to Sunday 17th September at the d'Coque Arena. Luxembourg is hosting the competition for the first time, but the country is no stranger to claiming silverware on the continent having won three gold medals at European Championships level. However, Luxembourg has never achieved a first position finish in the Women’s Championship Division tournament and while the country may not head into the 2017 event as title favourites Sarah De Nutte is hoping that the host nation can thrive at the competition with the backing of the home supporters. “It is a big advantage to the Luxembourg team having the home fans, I hope that we will have lots of support from the spectators”, Sarah De Nutte. 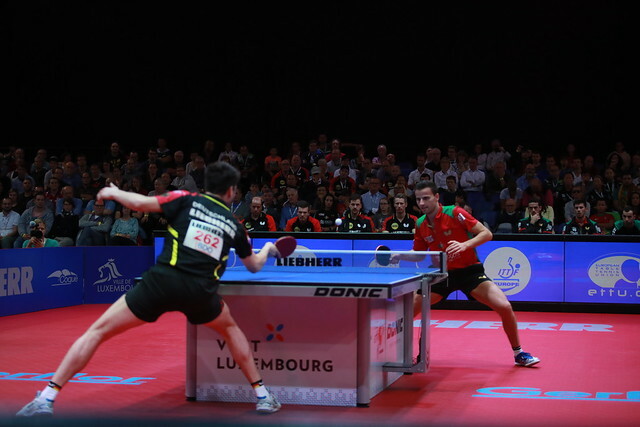 The Men’s Championship Division is expected to deliver plenty of drama, and Portugal is one of the teams which will be aiming to enjoy a strong outing in Luxembourg. Title winners at the 2014 European Championships and one year later at the 2015 European Games, Portugal has been a major force on the continental scene in recent years and the country’s highest ranked player Marcos Freitas is confident that the squad can compete for the trophy at the upcoming competition. “I believe that Portugal’s team could well be a force to recover the European Championships title after three years because we have had a good week’s preparation at a training camp in Porto. The most important thing is that we go ahead step by step and always focus on the next match”, Marcos Freitas. Defending Men’s Championship Division title holder Austria enters the five-day tournament dreaming of winning another shock gold medal in the category, and while star player Stefan Fegerl admits that the team will face a challenging campaign ahead he is also hopeful of retaining the trophy. “Because of the previous victory the team is under more pressure but we hope that we can keep the title”, Stefan Fegerl. Tuesday 12th September also marked another special occasion Stefan Fegerl’s 29th birthday, and following the conclusion of the conference the Austrian player was wished a happy birthday by his fellow table tennis colleagues.